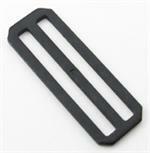 Jontay carries multiple sizes of regular and heavy black metal single-bar slides, ranging from 3/4" to 2". The 2" metal slide selection includes quick-fit adapter slides and metal connectors. The 1-1/4" slides match well with A-A-55301 1-1/4" black webbing.